These paintings are about feeling a sense of intimacy and safety against the turbulence and disjointedness of Society in our restless world. That’s not to say I want these paintings to be about putting your head in the sand, but to unite in kindness and support for one another, and these paintings aim to show that by depicting expressions of tenderness and friendship. Whilst the subjects are personal, I want them to be familiar to anyone. I use a dictionary of colour combinations as I find the limitation a useful aid in keeping the figures from becoming heavy and overworked. 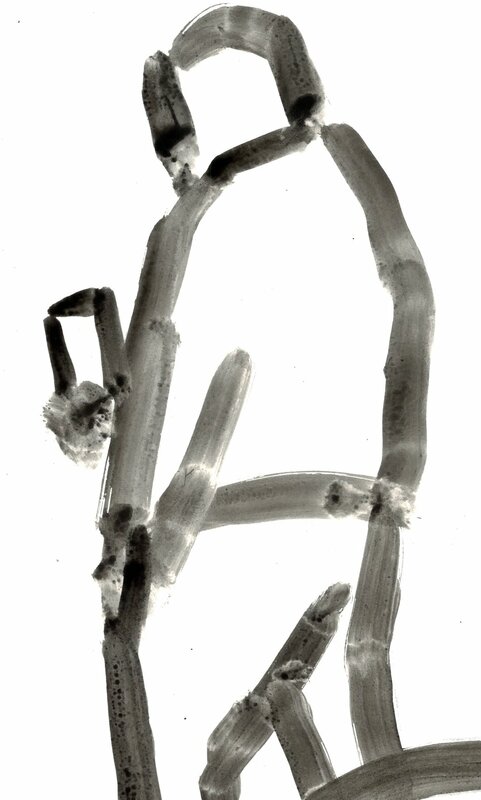 Bare feet, hands doing gentle tasks: absorbed figures who are comfortable in the close presence of the other subjects. I like the bodies to fill the canvas and feel at ease with each other. i. I’ve managed to get into a bit of a groove at Bainbridge had another brief but productive week there. I’ve got used to the presses, I know what inks I can use, I can blast my music out - I feel relaxed and happy there. I am grateful to have access to such a lovely studio! ii. We finished the term with a group crit. I showed the three works below and all were received really well - Jo and Leora seem excited by my work (I think). I’ve got a lot still to make for the degree show but I know which processes to use and have settled on a shared vocabulary that the work will share. I haven’t yet decided how to display the works but should have plenty of time to test that next term. A good week. i. After a productive afternoon printing at Bainbridge, I went for a drink with artist Frances Stanfield. Frances cofounded London Drawing Group and is producing a book about contemporary printmaking which I was asked to be a part of last year. I’ve followed her work for a while and it was lovely to finally meet her. I have begun to think about life after Camberwell and I hope to organise a group show with her next year. ii. Frustratingly on Thursday the studios were shut for a first year assessment and the workshops were shutting early for staff training. Rather than risk a short and unproductive day I decided to go and see a couple of exhibitions before I stop coming into London for the research break. Piano Nobile have brought together paintings, drawings and prints from each period of Leon Kossoff’s career in a concise but exciting retrospective (Leon Kossoff: A London Life). I was fortunate enough to have the gallery to myself and spent at least an hour admiring and drawing from the work. Kossoff’s unwavering commitment to a life simply depicting and celebrating the everyday - through images of his family, friends and London surroundings - is both powerful and poignant. Just brilliant. iv. On Saturday I visited Tate Modern’s enormous survey of Bonnard’s work with dad (Pierre Bonnard: The Colour of Memory). I’ve only ever seen a handful of Bonnard’s paintings in real life before and to experience this many at once (it felt like hundreds) was a revelation. The exhibition presents landscapes and domestic scenes which ‘capture moments in time – where someone has just left the room, a meal has just finished, a moment lost in the view from the window, or a stolen look at a partner’. The extraordinary show got busier and busier throughout the morning (uncomfortably so at times) and I thought back to the Hockney retrospective in the very same space a few years ago. Bonnard, like Hockney, is sometimes considered overly sentimental, perhaps even self-indulgent. 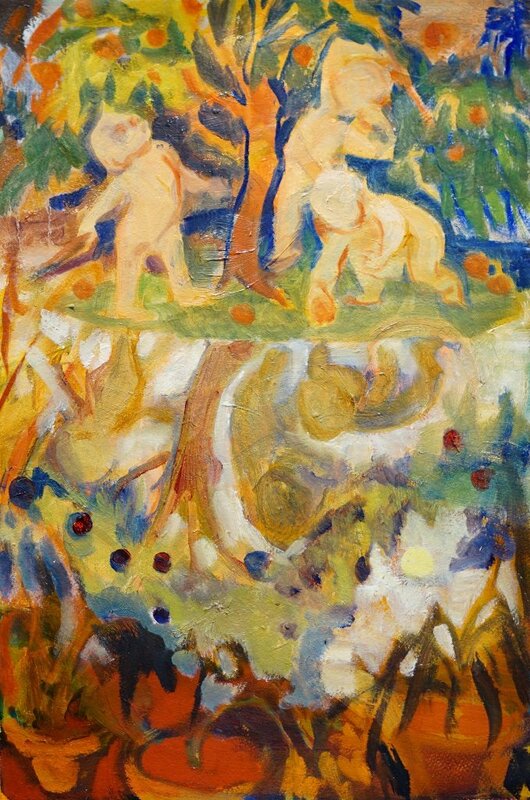 In his blog, my dad refers to a negative review of the show where ‘Bonnard is taken to task for not noticing historical events’ (two World Wars). In my research paper I referred to an article in the New York Times that suggested that, in a world of political and cultural tumult, it seems likely that artists might well react by ‘grounding their work in observable, human reality’. To create such sumptuous and celebratory paintings from the stuff of the everyday in spite of political upheaval - or perhaps because of it - is undeniably compelling. i. I have been standing in as a cover teacher for the past six weeks. Whilst mostly enjoyable and rewarding, it has been exhausting. Hopefully it hasn’t impacted on my uni work too significantly. I now have a week off for half term. ii. I started the holiday with a trip to George Shaw: A Corner of a Foreign Field, a small retrospective at the Holburne Museum. As an important contemporary, figurative painter, I find Shaw intriguing. However, I don’t particularly like his work: his smooth, photographic style often leaves the images feeling dead and flat, and the accompanying texts are, at best, esoteric. However, the exhibition itself was concise and well curated and I enjoyed the way a selection of Shaw’s drawings were presented (I sneakily took a photo for the blog - another idea for the degree show). iii. I’m getting worried about lack of time. Unfortunately last week I had tonsillitis and spent most of this week in bed, this week the workshops are shutting early for staff training and the next week there is a group crit... I’ve got a couple of sessions booked in at Bainbridge but it feels like this term’s practical time is already over! However I still have over four months until the degree show and a plan is coming together (I will be rejoining Bath Artist Printmakers from April, I can use Bainbridge if I’m in London and I do have some basic print facilities that I can use at school). If I use my time effectively I’m sure I can make a lot of good quality work and pull off a decent exhibition. i. I spent the afternoon at Bainbridge Print Studios creating the monotypes below (two versions of the same image). I like bits of both and may well collage them together when dry (I think you can be a bit more playful with a monotype - the conventions and fussiness of traditional printmaking don’t apply in the same way). Following last week’s tutorial I visited Intaglio Printmakers beforehand to buy some black Charbonnel 55985 ink and some white Somerset Satin paper - the ink/paper/press worked beautifully and I look forward to making more monotypes in the coming weeks. i. I had a tutorial with Jo which was both useful and encouraging. She seemed to think the work is going in the right direction and told me to stop doubting myself and the quality of the work all the time. Most of the tutorial considered how to display the work for the degree show. Jo didn’t like the idea of a framed, salon hang but agreed that ‘the work’ should be comprised of multiple etchings, monotypes and drawings. One idea was to create some large framed, pin-boards/panels on which to arrange the work (see below). Jo also suggested that I try and use the same colour ink and paper where possible to give the exhibition some uniformity. I hadn’t considered showing the work like this but I like the idea a lot. I now need to make much more work so that I can begin to consider a final selection in a few months’ time. ii. The rest of the week was spent in the workshops. I’m getting a bit worried about the lack of time left but just have to keep making, enjoy the facilities available and trust that a body of work will accrue. i. In recent weeks I’ve been increasingly frustrated with my tendency to over or under-wipe my etching plates. Over-wiping leads to patchy or pale areas of aquatint and under-wiping leads to overly grey prints. This week I worked closely with artist and technician Brian Hodgson to improve my technique and spent both days printing the same image (a recently-adjusted etching of my mum) again and again. By late morning on the Thursday I felt like I had cracked it and successfully printed (without assistance) half a dozen identical prints full of rich velvety blacks, bright whites and various greys in-between. I will try and exhibit/sell this print in the Bath Society of Artists show in May. Brian seemed pleased and I was delighted. It’s this sort of technical assistance that I can only get at college - a week well spent. i. Unfortunately this week I had an awful session at Bainbridge: despite having two heaters on full blast, the studio was freezing (it was so cold even my ink went really stiff and unusable). I managed to prepare some old zinc plates and do some drawing before retreating into a nearby café. ii. Thursday was a lot more productive and I begin two new zinc etchings (see below). I’m enjoying the sugar lift am increasingly dissatisfied with the actual wiping/printing of my plates. This is something I continue to struggle with and need to address. iii. Thursday also saw the opening of our group show, Common Ground, at Lumberjack Café. Unfortunately I couldn’t be there to hang the show but it looked good and the private view was busy - a nice thing to be a part of. ii. I had an encouraging group crit without any major criticisms, just to keep making and to begin to consider the degree show. 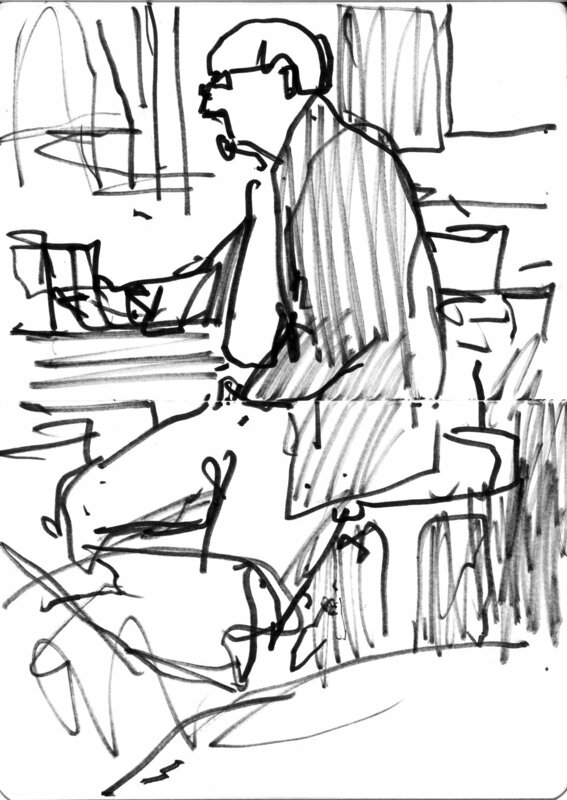 Somebody suggested that I try making direct trace monotypes in the pub but I argued that, even if I was allowed to bring ink into the pub it would change the dynamic considerably: rather than quietly observing, it would become an intrusive performance (no thanks). It was also suggested that I look into writers who have celebrated the pub scubas George Orwell’s The Moon Under Water. I will look into this. iii. Prior to the opening of an upcoming retrospective, I’ve become a bit obsessed with artist Sargy Mann. The documentary below is brilliant and fascinating: what an extraordinary man! i. This week was the first of term and it was great to be back in the workshops. Last term Paul Coldwell suggested that the colour might not be working so, after churning out some unsuccessful, colourful monotypes I ended up making the black and white print below. I think it’s strong so it’s an encouraging start to the term. Predictably this success was short-lived and everything else I made was fairly weak. However, it’s nice not to be too worried and to just be getting on and making stuff. I will keep transcribing my sketchbook drawings into etchings and monotypes. I think that’s a good plan for the time being. ii. Presented below are some of my recent drawings from the pub. I’ve enjoyed sitting there with my sketchbook in my lap, watching the goings on. I think some of these drawings are good in their own right and strong enough to be exhibited along the prints. iii. I attended the 60th birthday party of my family friend Stephen in Cheltenham. Stephen is a potter and, in a speech celebrating his sixty years, he was thanked for ‘contributing to the sum of good things in the world.’ What a lovely phrase. i. Happy New Year! I had a three week break from uni and work and spent a good deal of time drawing, reading, visiting shows and considering the upcoming term. I will share some of my drawings in the next post and use this one to instead discuss the contextual research I’ve been doing. ‘…trying during four years to learn something of the elements of my art, and realising, on leaving, how little one learns as a student and how much is left to be learnt for oneself in the dedicated ritual of one's own studio. I found this particularly inspiring as I begin to face the prospect of leaving art school (for the second time) and figuring out how to maintain being an artist and make a living. iv. Dad and I travelled to Birmingham for the day to see the exhibition Maman at The Barber Institute of Fine Arts. The show featured paintings and photographs of intimate interior scenes exploring the shared life of Vuillard and his mother. By ‘expressing the contemplation of beings and of things’ through quiet pictures of domestic scenes, Vuillard (alongside Bonnard) was labelled an ‘Intimist’. Whilst the paintings are modest in size and unassuming in subject matter, I found these depictions of everyday moments and familial relationships incredibly poignant and moving. Although Vuillard described a very different type of interior space, I long for my work about the pub to feel similarly gentle, melancholy and intimate. 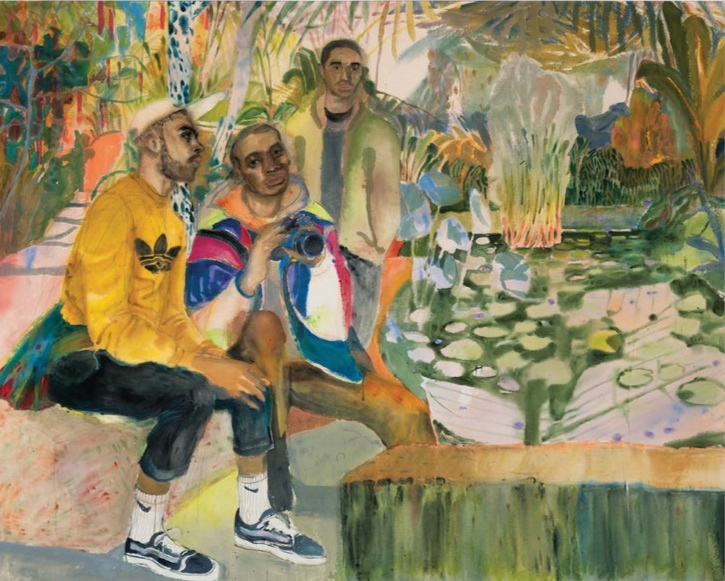 v. There are several exhibitions opening in the coming months that I am really looking forward to including Bonnard at the Tate Modern, Sargy Mann (curated by Chantal Joffe) at the Royal Drawing School and Diane Arbus at the Hayward Gallery. vi. A comment in my formal feedback from November suggested that ‘your confidence in the validity of your path is now strong enough for you to progress with energy and ambition.’ I have been considering how my work might develop before the degree show. I definitely want to get back into making monotypes (perhaps upping the scale as in Harry Whitelock’s work) as well as continuing my painterly etchings (perhaps using areas of tone such as in Rachael Neale’s monotypes). I feel as if the work is definitely going somewhere, I just need to stay calm and enjoy it. Rather than going back anxious, I am excited to get back into a studio routine. i. Christmas is here! I’ve now broken up from both school and uni until January. I will try and relax and catch up with a few admin jobs in my first week (updating my journal and website etc.) and then spend my second and third weeks off reading, drawing and visiting exhibitions. This time last year I was fumbling about trying to find direction for my work whereas I now feel much more confident. In a recent feedback tutorial Jo told me my work is in a good place to move forward next term which is reassuring and encouraging. ii. As it was my last week in London for over a month, I decided to visit several exhibitions. Firstly: The Drawing Year End of Year Exhibition 2018 at the Royal Drawing School was a mixed bag and featured several incredible artists/artworks (such as Charlotte Ager’s stunning Orange Horse Rider). However the expressive, playful and colourful work of Veronika Peat was my absolute favourite. 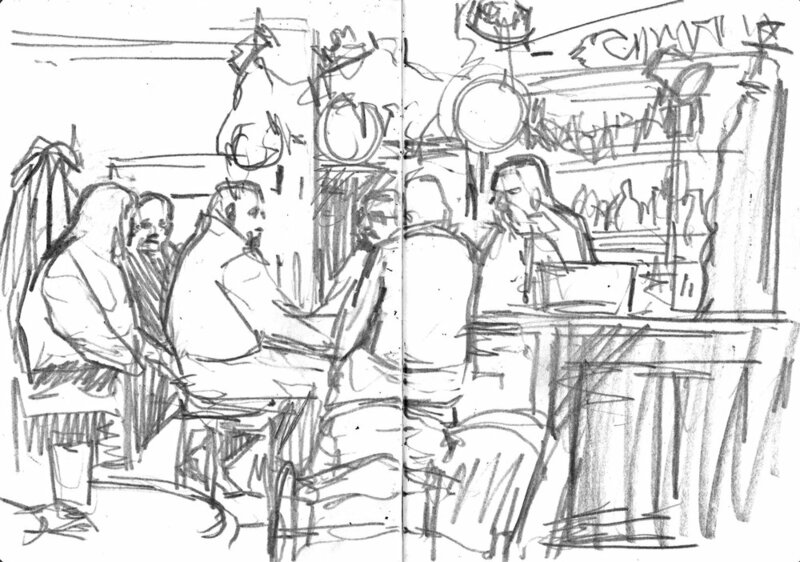 My making time is often limited to either being in the print room or sketching in the pub. Next year I intend to make much more time for drawing both in the studio and in situ. iii. 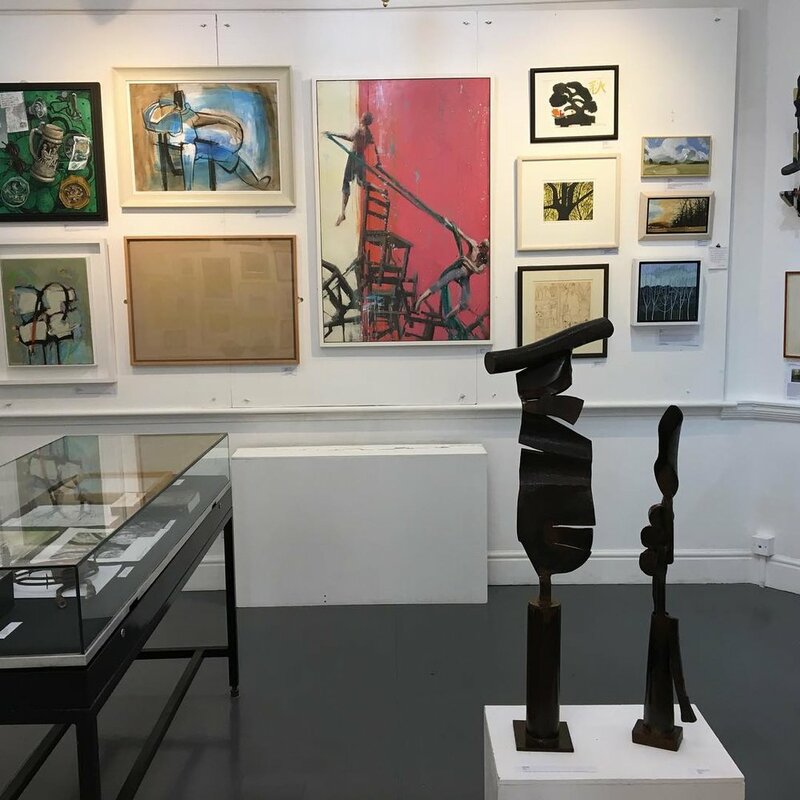 I was lucky enough to wander past Studio Prints, an exhibition of prints by Frank Auerbach, Lucian Freud, Ken Kiff, Leon Kossoff, Celia Paul and Paula Rego, at Marlborough Fine Art. It was a privilege to see these works ‘in the flesh’ (many of which I have pored over in books). Although none of the prints were huge, many were much bigger than expected and I particularly admired their reliance on drawing rather than technique. 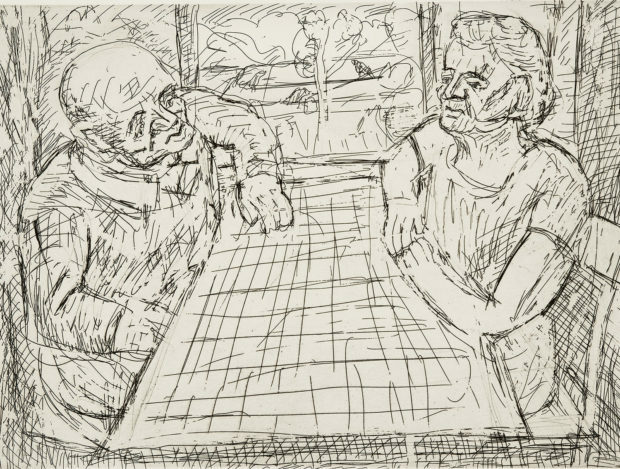 The Kossoff and Celia Paul etchings were particularly good. iv. 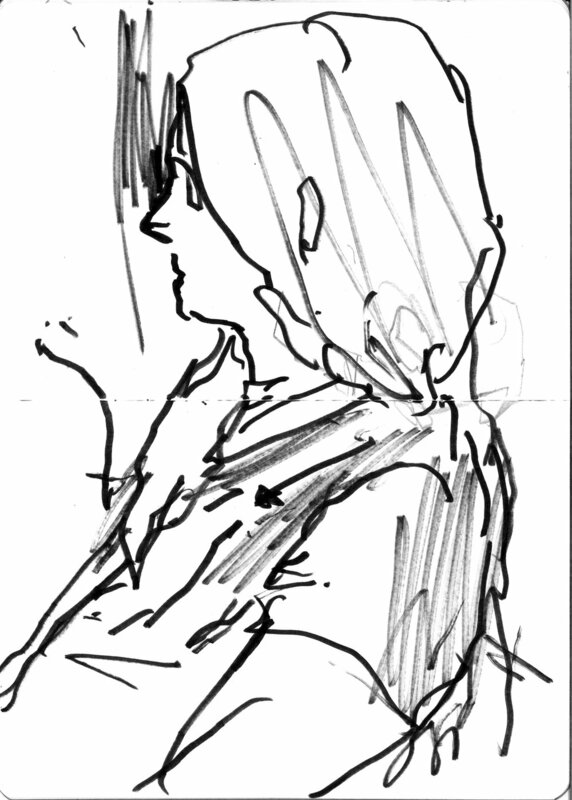 Jo sent me an email about a talk on portraiture by Deanna Petherbridge at the Drawing Room in conjunction with their current show Close: Drawn Portraits. Although I couldn't make the talk, I did go and visit the exhibition which featured portraits by Frank Auerbach, Cézanne, Maria Lassnig, Picasso, Paula Rego and others. 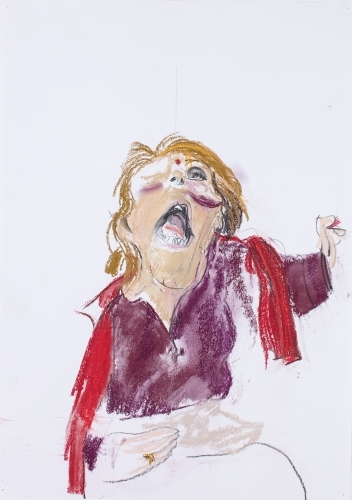 I enjoyed the wonderful Auerbach and Picasso drawings, but a series of recent pastel drawings by Paula Rego (perhaps inspired by Chantal Joffe) was particularly fresh and exciting. The essays in the catalogue also looked excellent and would have been helpful a few months ago when writing my essay (I will pop back in the new year for another look and to buy the catalogue). vi. I was recently contacted by Lucy McGeown and Frances Stanfield (cofounders of London Drawing Group) and asked if I’d like my work included in a couple of books that they are producing with Ilex Press about printmaking and drawing due to be published next summer. I am flattered to have been asked and of course I said yes! Liam was generous with his time: we visited the National Museum Cardiff, G39 and his studio; and we spent the whole day talking about our work, Cardiff’s art scene and contemporary portraiture. He gave me lots of professional advice and said I should stay in touch. It was brilliant to be back in Cardiff (where I completed my BA) and Liam is a good contact to have made. An encouraging day. ii. Whilst at the National Museum Cardiff we visited the Artes Mundi 8. The Artes Mundi frequently slips into worthiness with international artists asked to make work responding to ‘the urgent issues of our time’. However, it can also be inspiring, exciting and surprising: in my final year at Cardiff, Theaster Gates won the award for a huge installation comprised of symbolic, religious-looking sculptures and then went on to split the prize money with the other shortlisted artists. This year I particularly enjoyed Anna Boghiguian’s A Meteor Fell from the Sky, a monumental installation about the steel industry and the communities affected by it. It was an enormous and playful show comprised of drawings, text, sculpture and Ken Kiff-like painted cut-outs. I’m nervous about the idea of attempting anything too ambitious with the presentation of my work - I really worry it will look contrived - however it was exciting to see such an impressive and ambitious display. iii. At the Artes Mundi, Liam and I discussed whether or not art always needs to be socially-engaged or political. I don’t think it does but, when making work about people and contemporary life, it’s almost unavoidable. An article was recently published by the Guardian about the rate of pubs closing. Celebrating the pub and its community feels relevant and necessary. I keep being asked (in crits and tutorials) what I want the viewer to think or feel in the presence of my work, and themes of gentrification, loneliness and community have been mentioned. I welcome the discourse but don’t my work to deliver an explicit ‘message’ for fear of appearing didactic or condescending. i. This week we began Unit 2 in earnest and, as such, I’ve left a small gap after the end of Unit 1 which means that this post is quite large and encompasses two week’s worth of information. Unit 2 is defined by the Assessment Brief as ‘the resolution and presentation of your work according to your Project Proposal’ and, although we’ve been told to keep experimenting and not to start making for a show, we are being encouraged to begin testing the presentation of work and consider where it might be going. At this stage I can’t see my path changing radically (I will make work about the pub for the duration of the MA) but, through making, reading and discourse hope to go deeper with my research in order to create an exciting and resolved body of work. ii. In my tutorial and subsequent feedback, Paul Coldwell told me that my drawings are ‘complete’ and to be careful not to simply copy them. Although I understand his point, the artists I admire (Bonnard, Auerbach, Kossoff etc.) are able to use their quick drawings as an intermediate stage to larger, more impressive works. Tom Hammick often transforms tiny, notational sketchbook drawings into bold, concise prints. I believe I have the ability to do something more with my drawings than merely increase the scale of them. iii. I’ve spent a lot of time at Bainbridge Print Studios and the Camberwell workshops transcribing my observational sketches into etchings. After my initial excitement, etching with aluminium at Bainbridge turned out to be quite frustrating: it’s not as clean as zinc and a lot of foul biting occurred (although I was rushing somewhat). At Camberwell, I slowed down and simplified the imagery, etching bold lines and shapes to denote body language and suggest narrative. Inspired by Tom Hammick’s etchings I also incorporated chine-collé. There’s still a lot of improvements to make but I’m having fun and can see myself making several prints in this manner. iv. Between 1963-65, Richard Diebekorn made a book of prints, 41 Etchings and Drypoints. He took zinc plates home and drew, from life, still lifes of the breakfast table, landscapes through the window and portraits of his wife reading. Through their simplicity, immediacy and cropped compositions, Diebekorn offers us quiet, intimate snapshots of his home-life. Before the end of term I plan to prepare some hard ground plates to take to the pub over Christmas to work on directly. iv. On Thursday afternoon I travelled over to the Woolwich Contemporary Print Fair. It was a really strong show of contemporary printmaking featuring lots of familiar names and some brilliant work (Sadie Tierney, Jake Garfield, Paul Wardski and others). However, there’s a polite, technical, neatness found in a lot of printmaking which I find pretty boring - I liked the clumsy, painterly monotypes (by Marguerite Carnec, Daisy Jarrett, Tamsin Relly) best. I don’t want my prints to look too perfect and want the process to be clumsily visible. v. This week also saw the opening of a group exhibition at London College of Fashion. Because of assessment deadlines and an attempt to please everyone, the show ended up with no real title, a boring poster and next to no advertising. I enjoyed hanging it with everyone and the show looked good. I also think that if we had let one person curate the show, rather than attempting to organise it democratically, it might have been a much braver and exciting exhibition. We’re putting on another group show in January which I think will be stronger. vii. On Friday I went to the pub with artist Seb Thomas. Seb graduated from MA Printmaking at Camberwell the year before I started and now also lives in Reading. It was brilliant (and reassuring) to talk to him about his experiences on the course (as well as about music, film and art). Seb’s advice was not to worry about fitting in with the work of my peers and to stick to my guns and not change too radically. He likes my work and we discussed the possibility of show in Reading next year. A really good evening. i. This is my last post before the Unit 1 assessment next week. It’s been a useful exercise to sort through and organise my work from the course thus far. I thought I was going to feel somewhat sheepish about my submission but, on reflection, I’ve made a lot more work than I thought and feel confident with where I want to take the project in the next few months. I look forward to my feedback in a couple of weeks’ time. ii. This week I spent two long days producing test strips for etchings. (I had intended to do this two weeks ago but, frustratingly, there was no access to the acid room at uni due to issues with the ventilation system.) I also completed my first proper workshop session at Bainbridge Print Studios which is equipped for etching aluminium (as well as zinc and copper). This is an exciting prospect due to its inherent qualities (for example it doesn’t need an aquatint) and because it’s so cheap! I’m certain these test strips will become an invaluable reference in the coming months. iii. I finished the week with a tutorial with Paul Coldwell. It was useful to talk about my practical work instead of my research paper or upcoming assessment. 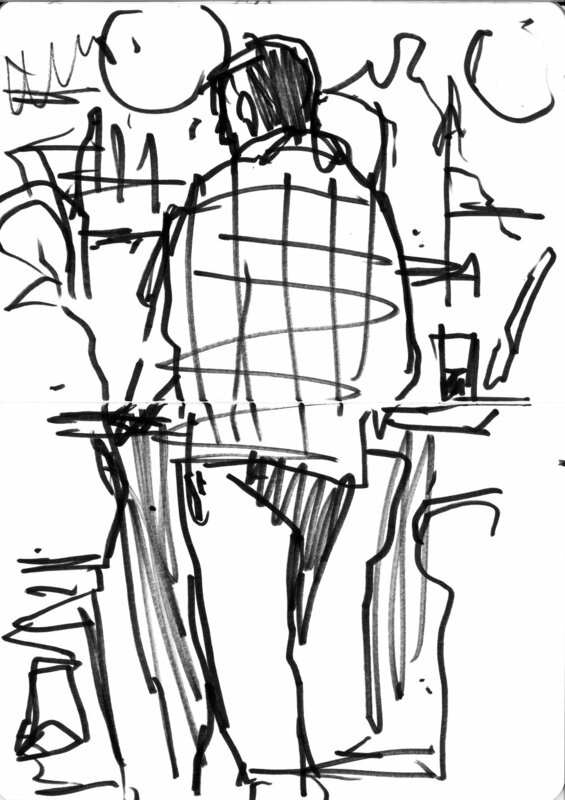 Paul suggested that it’s time I upped my engagement with the project and spend a lot more time drawing at the pub. He suggested I take plates in to work on directly and to consider how I might display them. One suggestion was to frame loads of drawings and prints and display them haphazardly (similar to Gilbert and George’s Drinking Sculpture). I then spoke about my lack of confidence in crits and tutorials (particularly as to how contemporary a body of work it is). Paul told me to stop worrying as I’m not there to seek approval and that I have to convince others of its importance and relevance through the quantity and quality of the work. He also suggested that it links to contemporary life (such as possible associations to the rise in loneliness) but that these connections can only be made by the work. The work is fine, I just need to make more. Things to look into: Eric Fischl, Giacometti’s Paris Sans Fin and Gilbert and George’s pub works. ‘Many artists have explored identity knowingly by ingenuously using the portrait ‘playfully, ironically, or parodically’. Yet through Yiadom-Boakye and Joffe’s honesty and sincerity one can experience directly the vitality, intimacy and vulnerability of human experience: ‘fashions in art come and go but there’ll always be a place for what is authentic, for what is true’. ii. Now that the essay is in, it is of paramount importance that I get back into a practical routine as quickly as possible. I’ve scheduled twenty hours at Bainbridge Print Studios before the Christmas break and there are several Thursdays devoted solely to workshop time. I’m going to have to capitalise on weekends at school where I can and perhaps use the Bath Artist Printmakers workshop again at Christmas. Time to get making. iii. Conversations about degree show fundraising/preparation have begun. It feels like a long way away but I’m certain it’s going to come quickly. Additionally, Thom has also arranged two small group shows for us as year group in the next few months. The first is in a few weeks’ time at London College of Fashion’s exhibition and project space and the second is at Lumberjack Cafe in January. iv. During my half term break, I spent a couple of evenings life drawing. I haven’t been life drawing in months and I loved it. Managing school, my MA and a social life means my time is often squeezed into a strict schedule. On moving back to the South West next summer, I want to slow down and find the time to attend life drawing and regularly go painting and drawing again. v. I exhibited a couple of works in the Bath Society of Artists members show. It was my first time exhibiting in the annual members’ exhibition, which ‘this year takes its lead from The Badminton Game, a painting by its current president David Inshaw RWA. Source explores the materials and ideas artists draw upon as inspiration for their work and will exhibit members developmental materials along with final works created from these sources.’ It was a decent show and I am happy to have been included. i. Jo warned us not to neglect our studio practice whilst we write our research papers but I just don’t have the time get in the workshops as well. I also feel so out of any sort of practical routine that I know I won’t be able to get back into one until this essay’s handed in. ii. We finished the week with a group crit that was fairly positive. I think people agree that there’s mileage in my current work but it can get a bit wearing having to justify every single decision I make (colour, composition etc.). I just want to get this paper finished so I can get back to making. iii. I followed up on a prize I was awarded earlier in the year: a year’s use of Bainbridge Print Studios. I signed a contract, completed an induction and booked in some printing sessions over the next few weeks. Luke Wade, a Camberwell alumnus and skilled etcher, will also be there on Wednesday afternoons which will no doubt be entertaining as well as educational. iv. Thursday was devoted to Symposium 1, a series of short presentations by all MA Printmaking students summarising our practices. It was reassuring to look and reflect on the last year and realise how much progress I’ve made (and I think my work looked strong). There are some really exciting figurative artists (Liora Tchiprout and Liliana Romero) in the year below. Perhaps there may be opportunity to exhibit with them in the future? It also helped me to think about why I make the work I make. Both artists reference their cultural heritage (Jewish and Columbian respectively) in their work. I’m a white, middle-class man from the South West. Making work about my experiences (via the pub and other portraits) may seem less politically-charged but it’s certainly no less authentic. v. On Saturday, I spent the day visiting galleries in London with my friend Beth. We briefly popped in to see Babes in the Orchard, Rachel Mercer’s small group exhibition at Mercer Chance. Geraint Evans (who exhibited a few weeks ago) and Michael Chance (the next and final show) and both brilliant artists but tend to have a rather negative outlook on the world whereas Rachel’s paintings are always playful and joyful. Sadly, it was probably my final visit to Mercer Chance (they close for good in a couple of weeks’ time). I’m grateful to Rachel and Michael for the support they’ve shown me over the last couple of years and wish them well with whatever they do next! vi. We also visited the Photographers Gallery to see Silver Lake Drive, an exhibition by Alex Prager. Prager makes filmic photographs and short videos that reference Hitchcock and Film Noir. The work throws you into the middle of complex narratives but never reveals the whole story. Jo has spoken about narratives in my pub images - perhaps this is inevitable given the subject matter. Also on display was Tish Murtha: Works 1976-1991, a series of documentary photographs that offer ‘a tender and frank perspective on a historic moment of social deprivation and instability in Britain’ including several of a pub in Newport. The photos were bleak but also honest, poignant and surprisingly tender. i. Back to uni this week. Reflecting on my first year, and rereading my project proposal, I don’t think I’m doing as terribly as I often thought last year. I intended to develop painterly printmaking through etching and monotypes, which I’ve done or am beginning to do. Lithography was a dead end but at least I did attempt it. I also wanted to explore the contemporary context for portraiture which I’m doing through my research paper. It’s slowly coming together but I’ve still got lots to do. I’m looking forward to getting it over with, getting back in the workshops and upping my game a bit. It’s going to be a busy, but hopefully really exciting, year. I’ll also try and keep this journal going regularly again. ii. On Thursday, I visited the private view of Surface Worlds: Reflections in the City, an exhibition by my friend Geraint Evan. The exhibition explored themes of class and consumerism through drawings (and soundscapes) made from the shop window reflections of Oxford Street. I admire Geraint’s ability to capture the minutiae of everyday life. 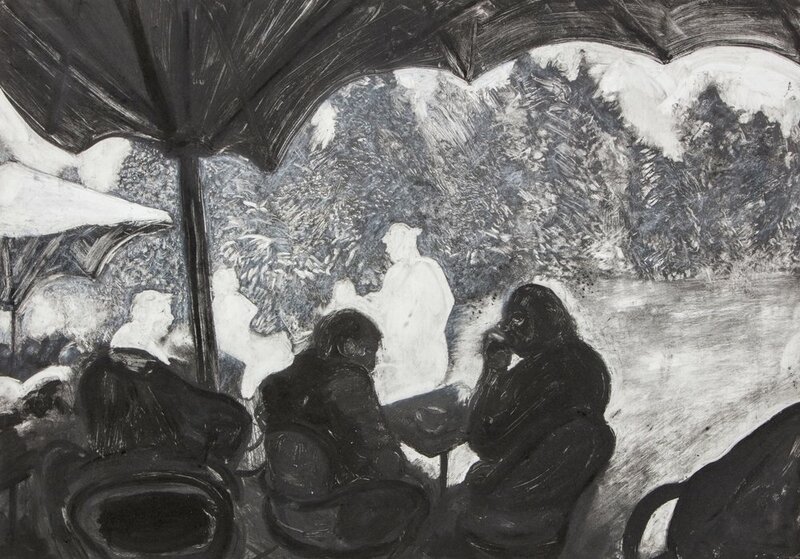 He elevates the mundane through intricate, brooding charcoal drawings. An impressive show if a little pessimistic. iv. The Shrewdness of Apes, an exhibition by Camberwell alumnus Jack Fawdry Tatham, is currently on show in the student gallery at uni. The exhibition showcases a series of etchings that have been influenced by the natural world and human relationships. The show is fun, witty (Adam and Steve is a brilliant title) and technically brilliant. It’s also a good reminder that I definitely want to get better at etching. I began to get somewhere at the end of last year by using aquatint, sugar lift and spit bite. Now it’s time to really push and develop those techniques - I want to get really good! ii. We spent our first two days in Scotland at the Edinburgh Fringe and also managed to visit the Scottish National Gallery of Modern Art to see Emil Nolde: Colour is Life. 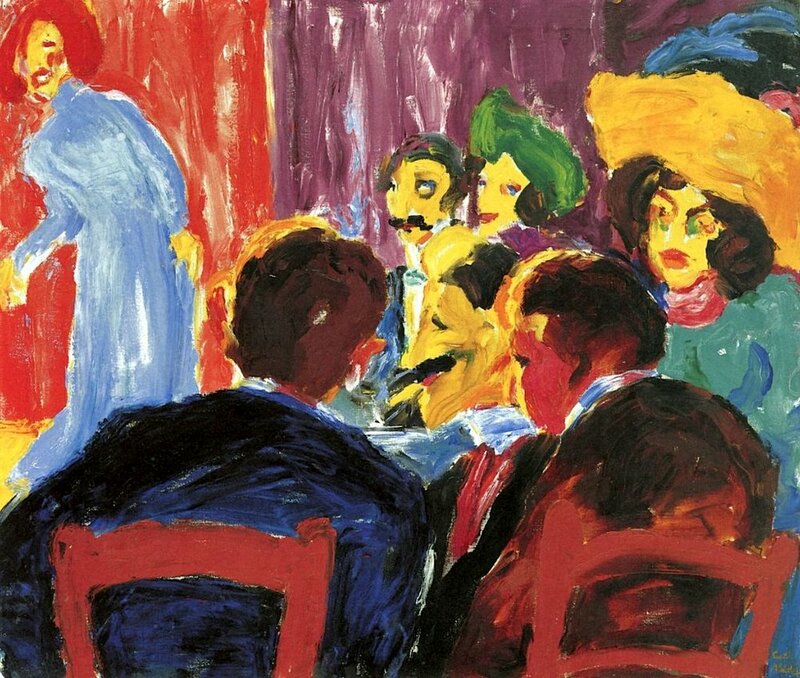 Nolde was one of the most influential German artists of the twentieth century and the challenging exhibition did not shy away from or excuse the artist’s political beliefs and anti-Semitic views. It was an extraordinary show of brash, raw, colourful paintings and prints of dramatic landscapes, bizarre portraits and raucous bar scenes (which I will look closely at in relation to my own work). I loved it. iii. On our way back from Scotland we stayed in Manchester specifically to visit Chantal Joffe: Personal Feeling is the Main Thing at The Lowry for my research paper. It was a brilliant, joyful show of of intimate, awkward and relatable paintings of everyday life. I made pages and pages of drawings and notes as part of my essay research. Before we left for Scotland I emailed Leora the abstract for my research paper and, as well as some criticism and advice, she finished with 'I think you're well on the way'. I feel encouraged and informed and ready to get stuck in. iv. At the beginning of the summer I left Instagram for a month. I think Instagram is an incredible tool but it's very easy to start comparing yourself to others (specifically those I consider my peers) in terms of quality and output and consequently wind up feeling inadequate and disheartened. The break was useful as on returning to it I felt inspired by playful, confident and exciting work by artists such as Ella Squirrell, Holly Froy and Matthew Cotton. On returning to uni in October I want my work to be bigger, braver and more experimental.